Coverdale Farm Preserve of Delaware Nature Society in historic Greenville finally had their festival. It must be October again! The perfect excuse to view crowds milling about crafts and activities – from a distance. A good hundred yards away, by the food trucks, is a covered sound stage. Five bluegrass and Old-Time bands are scheduled. Chair, book, snacks, ACTION! Every group was great but I did notice a new face. 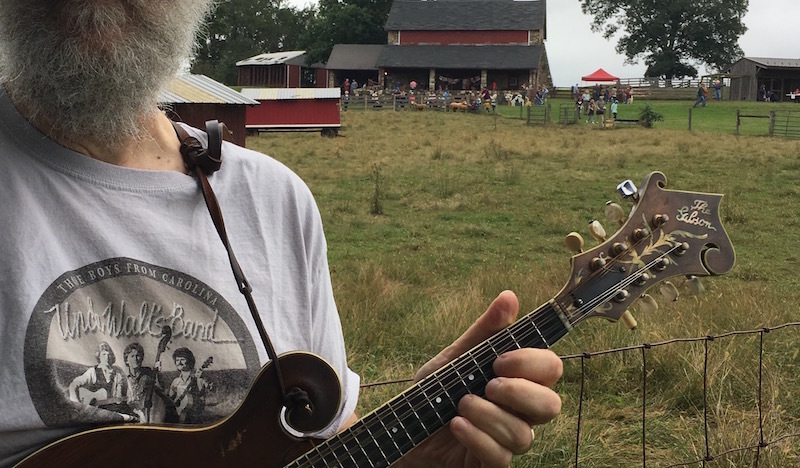 Harrisburg native Henry Koretzky brought his 1989 Crafters of Tennessee mandolin. It sounded like a vintage Gibson mandolin – someone had even inlayed “The Gibson” into the headstock. A parts mandolin, its wood reportedly sourced from Gibson itself. The real story will never be known, having died with famous Dobro player and shop owner Tut Taylor. For the traditional sounds of Appalachian old-time, bluegrass, and early country music, I now know where to find an expert. As well as perfect contra dance music. The Contra Rebels, with Barb Schmid on fiddle, Todd Clewell on banjo/fiddle/guitar, and Henry Koretzky on guitar/mandolin. Special thanks to Tater Patch for performing one of my favorite tunes, Lazy John. Another fantastic version of Lazy John is Roger Netherton’s 2016 rendition. This entry was posted in Music and tagged Contra Rebels, Coverdale Farm, Harvest Moon Festival, Henry Koretzky, Tater Patch.